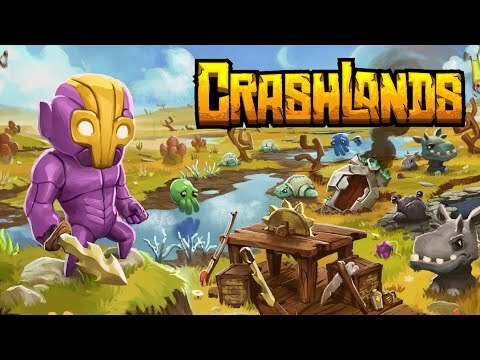 Wow, honestly guys I was very surprised when I looked at this game “Crashlands” published by Butterscotch Shenanigan … I don`t know how to say it. Let`s call it AMAZING! I was not the type of person who will go crazy for Minecraft, at the beginning everything about this crafting and collecting thing was so boring for me. I mean what is the meaning of losing time and brain cells to build something that is not real and no one can appreciate. The only thing that can make me do it is if it is fun! At first, I was thinking myself “OH NO, ANOTHER CRAFTING GAME”, but after playing this baby I can assure you guys, this is everything but not boring at all. These publishers have made a real masterpiece here, I am not kidding. This game is made with a lot of humor and dedication. From every second you can see and sense the game craziness. But let`s go to the gameplay review and see where can we go from there. Crashlands uses quests to slowly open itself up to the player. You can’t craft any object unless you have a recipe for it, and while new crafting stations will come with a small selection of recipes, you’ll have to find the rest on your own. And there is the action part. To collect the ingredients you have to fight with the wildlife of the game and beat them to crap. Might sound cruel but believe me it is incredibly fun! the game’s core structure is built around the big things. It takes its time teaching you the ins and outs of each new toy, and every time you get a new one it feels like a major accomplishment, one that opens up even more possibilities. All of your active quests can be perused from your quest log, making it a simple matter to check what needs to be done at any given time. It’s easy to lose hours of time following along the little daisy-chains of quests, even though from a gameplay point of view you can stop at any time without losing anything. Everything is craftable by you. I will be honest guys, this game is a life eater. Once you are hooked there is no turning back! Fun and addictive game. I am sure that after you get this game your smile will be all over your face!